Posted September 29, 2016 by Polis Loizou & filed under Events. An adaptation is always going to differ from its source material. A play can’t be the book, and neither can a movie; what’s necessary is to capture the mood and essence of the story and transplant it to a different medium. Jonathan Glazer’s remarkable film Under the Skin, for example, is such an abstracted adaptation of Michel Faber’s book that it’s almost video art. Yet it works all the better for its surreal approach. On the other hand, George Orwell’s dystopian masterpiece Nineteen Eighty-Four has had worse luck with adaptations, the biggest crimes usually relating to its powerful ending. 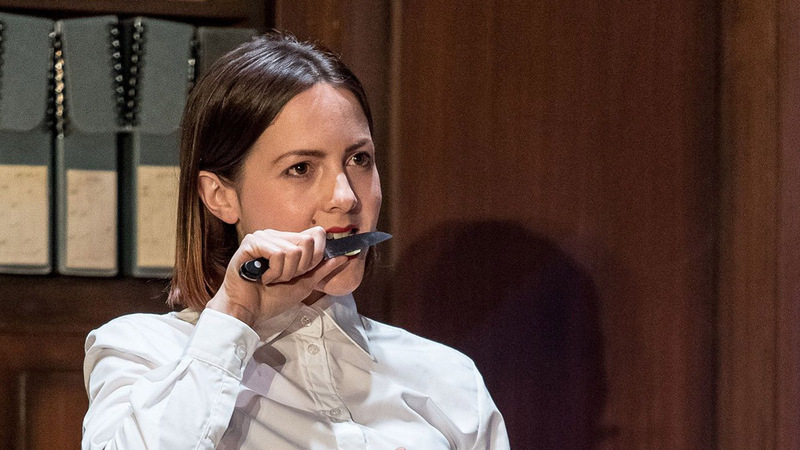 Thankfully, with a packed run at Almeida Theatre and sold-out international tours across the globe under its belt, Headlong’s 1984 production retains both the mood and essence of its source material. And, most importantly, writers Robert Icke and Duncan Macmillan do well to leave Orwell’s ending alone. Well, sort of – but more on that later. Brilliantly combining the ‘40s and ‘80s – decades which, after all, shared aesthetic aspects – designer Chloe Lamford has created a marvellous set that is perfectly utilised in the developing drama, particularly during a jaw-dropping transition in the final third. 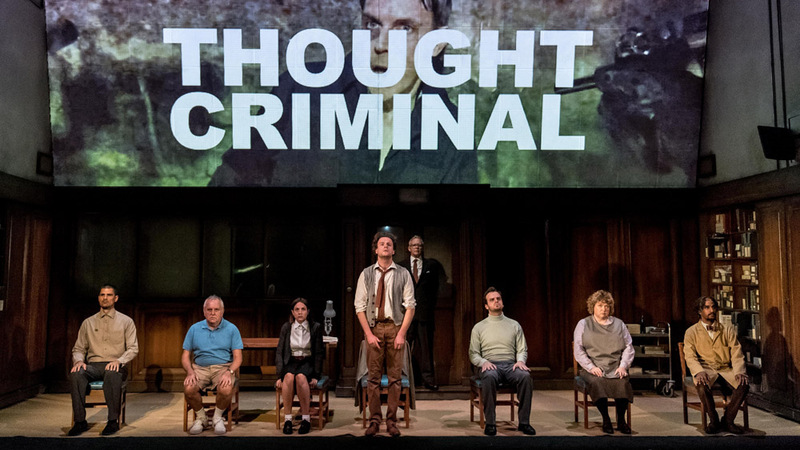 This is also when 1984 becomes a thrilling theatrical beast, bringing the nightmare of Orwell’s vision to life. The scene in Room 101 is devastating, and easily the high point of the night’s entertainment. The use of multimedia is also perfectly suited to this story; what better way to present Orwell’s voyeuristic society of Big Brother than with live video feed? We watch Winston and Julia conduct their affair in that idyllic secret room as though we are the Thought Police, the most intimate moments of their relationship through a screen. Potent stuff. The dreamlike repetition of certain scenes, while at first seeming like a tribute to Eternal Sunshine of the Spotless Mind, ultimately works well in reflecting Winston’s work of editing and erasing truth. Meanwhile, the audial motif of ‘Oranges and Lemons’ does its best to possess our minds. It doesn’t all land. Headlong frame their adaptation with a host of characters from the future who have discovered a manuscript by Winston Smith from 1984. While it was presumably meant to highlight the increasing relevance of Orwell’s book, this is an approach usually employed by Drama undergraduates, and sits awkwardly with the rest. One character’s epiphany about government conspiracy continuing in 2084 simply feels clunky, and treads on the feet of what just preceded it. Nobody does endings like Orwell, so why mess with them? The acting is solid throughout, with Andrew Gower (Being Human) as Winston Smith and Hilton McRae as O’Brien bringing fireworks to Room 101, while Doctor Who actress Catrin Stewart impresses as Julia, the woman who prompts Winston to rebel. A glorious headfuck at times, 1984 is an incredibly strong piece of theatre and well worth checking out before its limited run at the Playhouse Theatre ends on 29 October. Performed on Tuesday 28 September 2016 at the Playhouse Theatre in London. Buy tickets on the official website.